I've wanted to read this ever since I read That Book Woman, so I was happy to come across it on the shelves at my new library. What a great book! The text is straightforward and simply written with wonderful photographs spread throughout. The pack horse librarians of Kentucky were a hardy group of women! I wonder what they would think about the problems libraries are facing now? Although seeing the hardships they faced really helps to put some perspective for me on the tough times we face today. I don't have the budget I would like for new books, but I can check out multiple books to every student and still have full shelves. And I don't have to ride a horse through freezing rain to get those books to my patrons. Every librarian or fan of libraries should read this book! Compare today's hard financial times with the Great Depression and get some perspective. Also look at how the American people responded to adversity by stepping up to the plate and working to help themselves and others. Hopefully our new President can rekindle some of that American pride and spirit. WPA stamps are out by the USPS. I bought some because I liked how they looked, but it wasn't until reading this book that I learned that WPA stood for Work Projects Administration. It was created by FDR in 1935 to "put people to work" and "to promote social and cultural awareness with art, theater, and literature." As a result, pack horse librarians were hired to take books to people living in the eastern Kentucky mountains, and it was this book for kids that told their story. Robinson Crusoe and poetry by Robert Louis Stevenson were some of the most-favored books of the kids. My most-loved part was the fact that some people were too proud to accept a book even though they would return it on the next go-around. Because of this, they would often give the librarian a recipe or a quilt pattern in exchange for a magazine or book. The recipes and patterns were then put in a scrapbook and would be put in circulation for other "library" users. Just like today, the pack horse librarians listened to what the people wanted and tried to create collections based on needs.I THINK this book was weeded from my school's collection because of an old copyright and low circulation. It's one of those books that is heart-warming, but that kids just aren't too interested in reading on their own. It's a great before bed book that an adult could read to a little. A interesting look at one of the many programs FDR put into place during the Great Depression to get people working again. Following the norm for these programs job descriptions, it is hard, somewhat dangerous work, but unlike most of the other programs (the construction of roads, dams, bridges, trails, etc.) this job was mostly filled by women. I am, of course, biased to be favorable to this book as it combines two things I love, books and horses; and having gone to college in Kentucky, I can imagine the terrain (and weather) these riders and horses would have faced. One of the most interesting aspects of the book I found was the "exchanges" and "scrap books". People weren't comfortable with the idea of getting books and magazines for nothing (even knowing they would be returning them) so they would share recipes or patterns with the librarians, some of whom collected them into scrap books, which they would enter into circulation for the library! Anyway, a good look at the time period from a different perspective, and though the conditions of the people aren't "watered down", it isn't depressing like a lot of 1920's books. Content notes: No language issues; women are mentioned being pregnant, but no sensuality; danger from weather and moonshiners is mentioned, but other than the librarian getting very cold on her route, not seen during the story. Of interest: the librarian prays and sings hymns as she's going about her route, which the author does not paint in a negative light. A children's book -- but very good nonetheless. 4 stars only because I wanted more detail about the project, which I'd probably find in an adult book. It was a hard job being a pack horse librarian, traveling in all types of weather for many hours a day, but the rewards were great -- putting books and information in the hands of people of all ages, even if you couldn't read (some couldn't -- and either had someone read to them or asked for picture books). Homes were in portions of Kentucky that were mostly impassable except by foot or horse. This is a time before electricity was available in many parts of Kentucky, so entertainment options were few, Books filled that purpose. Why: We just read the lovely picture book "That Book Woman," a fictional account of one boy learning to read because of a "pack horse librarian." In a historial note in the back of that book, it mentions web sites and books about the WPA and the pack horse librarians of Kentucky. I'd never heard of them! Apparently this recommended book has many great photos taken at the time and I'd like Logan to see those. The text is for older kids, but we might read a bit of it here and there and I know that I myself will read the whole thing! This book is geared towards children and young adults. It does not, however, talk down to them and can be easily read by adults.Appelt and Schmitzer shed light on a little known part of the New Deal. In Kentucky, women were hired to transport books by horseback to out of the way places. It's a very interesting book and looks at what the work entitled as well as the influence it had in the future. If you are are interested in libraries or horses, this is a good book. Something about this book left me proud to be a woman, an educator, a horsewoman, a mountain person, and a citizen of a country with enough vision to implement a program like this. I confess, history is not a big passion of mine, but this book hooked me, and therefore I'm confident it will hook my students too. This is a juvenile non-fiction book. Not generally something that I read, but it was about a program of the WPA during the depression that I was not aware of at all before reading it. It has sparked my interest to learn more. What some people will do to get books into the hands of patrons! Every librarian should read this. Combine it with My Librarian is a Camel by Margriet Ruurs. A 55-page look at how the WPA program of the Pack Horse Librarians of Kentucky was envisioned by Eleanor Roosevelt and implemented to provide women in remote areas with work during the Depression and a way to "feed people's minds". 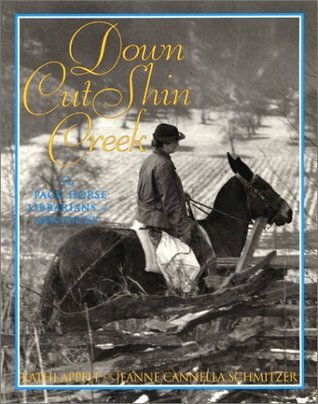 Wonderful photographs on almost every page make the text come alive.Most of the book is based on the interview of Grace Caudill Lucas, a former pack horse librarian, who shared her story with the author in the fall of 1999. The authors make the story of these intrepid women who rode long miles several times a week into remote areas with steep hills and deep hollows to deliver books to families that had no access to the written word come alive. These riders had to overcome the natural suspicion of these remote families who were very protective of what ideas these books and pamphlets might be putting into their children's minds as well as cope with the difficulties of the trail and the excesses of the weather. The other amazing side story was how the books were gathered to start and continue this project plus the loving care and repair that enabled the project to continue. In all, a most interesting sidelight into a lesser known aspect of the time, place and effect of the WPA. This 58-page book is full of interesting facts and photographs about the lesser-known Pack Horse Librarians, who carried books to those living in the Kentucky mountains during the Great Depression. Reading this certainly puts things in perspective and it's interesting to contrast American poverty in the 1930s to American poverty nowadays. I highly recommend to teachers, parents, and librarians to introduce this historical book to their children as it will teach them about the difficulties the Depression produced and how determined, brave people overcame some of the difficulties through serving and helping others. Ever since I read about this fascinating piece of history on the Atlas Obscura website, I've wanted to know more. This was a wonderful start for me. It has a concise presentation of information, in an enjoyable layout. I love the photographs, and the rice pudding recipe sounds delicious. I was impressed with the imagined way an ordinary day would have been for one of these librarians. It would make a wonderful novel. There's an excellent bibliography (I love the article titled "The Times Were Tough, but Book Woman Was Tougher") as well. Fascinating book about the pack horse librarians in the 1930's that worked for the WPA and took books and magazines to people in the hills of Kentucky who would otherwise have had no access to libraries at all. This juvenile, non-fiction book is illustrated with actual photographs, which document the history of this important effort to get reading materials to the children and adults who otherwise would have had none at all. Incredibly edifying nonfiction book about the Great Depression and how librarians delivered books to people who had nothing else. If you want a quick read that will make you feel like you really learned something, pick this book. A hearty thanks to my niece for recommending this book. It is always interesting to find a book that gives you some knowledge of a little known piece of history. A fascinating story about some really dedicated people at a desperate time. Great read for all librarian enthusiasts. Although short, this book "packs" a lot of information about the Pack Horse Librarians of Kentucky. I first read about this federal program in Wonderland Creek. During the Depression as a part of Franklin Roosevelt's New Deal programs, local people (mostly women) were hired to deliver books and magazines to schools and homes in the mountainous regions of Kentucky. These residents were poor and isolated. The librarians traveled over dirt paths in all types of weather to bring reading materials. Each pack horse library served between five and ten thousand people. Over the course of the program, thirty counties and over 100,000 people were served. The pack horse ladies were dedicated, ordinary women who were doing what they could to make life better for themselves, their families, and the people around them. Salaries were twenty-eight dollars a month. By today's standards that seems a pittance but during the Depression workers were glad to have work of any type. There were no welfare programs, they implemented WORK programs. I found this book to be inspiring and educational. I often wonder why the federal government decided it works better to pay people without expecting anything from them. I bet these pack horse librarians had a strong sense of accomplishment and purpose at the end of the day when they could finally rest. A great little book about a little known group of very special people. During the Great Depression, President Roosevelt came up with his New Deal, a plan that included putting Americans back to work. In one state, dozens of women--and a few men--found jobs as pack horse librarians, carrying books, magazines, church pamphlets, and other printed items to families located in remote parts of the hollows and mountains of Kentucky. All their materials were donated, but these hardy pioneers persevered in delivering them, sometimes on foot, other times by horse or mule, to the residents of these hills. Their actions layed the groundwork for a love of reading among many hundreds of families, and led to later establishment of state-supported libraries, bookmobiles, and literacy programs. Although published a few years back, its story is even more important now considering the state of our nation's economy and the need for libraries to serve the millions who are suddenly finding themselves out of work. Wow, I didn't know there were such Librarians in our history--Pack Horse Librarians who travel by horse and feet to bring the written word to remote parts of the Appalachian, Kentucky. These Librarians worked for very little amounts of money to deliver books, magazines, newspapers, and even their own scrapbooks to places where traveling by car is impossible. The Librarians' salaries were paid by the government, but the materials were all from donated items by the public. The Pack Horse Librarians would bring materials to schools that barely have enough books to go around for students, or much needed health information for expecting young mothers. Children's books were especially treasured by both children and adults, since the illustrations in these books could be looked at by those who couldn't read. It is amazing that these Librarians would make their deliveries on a regular basis through both good and bad weather...There will no longer be any complaints from me about being a Librarian in 2013!! Librarians are rarely shown riding horses to deliver books but here is a book that does. Pack horses traveled the back woods of Kentucky and librarians were hired (you did not have to have an MLS to ride a horse) to carry their precious cargo: housekeeping magazines, popular books, fishing guides, children's literature. The book opens with an actual librarian on her 20 mile route, and shares the experience of visiting a variety of people on her way. This includes an 8 month pregnant young girl and an elderly woman who herself must walk six or seven miles to greet the librarian. Other chapters include how the service was started, funded, and stopped. The sidebars are full of interesting facts like how the truly poor make do with practically nothing, and re use everything, wasting nothing. Another children's book recommended by the Goodwill Librarian. This provided a story and then the history of the Pack Horse Librarians of Kentucky. This was a part of the WPA that provided women employment and fulfilled a desperate need for reading materials for schools and families. The WPA paid the women $28 per month for their efforts, but did not provide a horse or mule, nor any reading materials. All the reading material was donated. The librarians were accepted into peoples homes because they were women from the community. Many people had too much pride to accept something for free, even on loan, so they gave the librarian what they had - often a recipe (receipt) or a quilt pattern. Many of the librarians collected these gems into scrapbooks and the scrapbooks went into circulation as well. This was a terrific book. What a great story! Not only was the story fantastic, the book was packed full of photographs. I love that. Do you know about the Kentucky Pack Horse Librarians of the Depression? This was a program of the WPA. With one exception all the librarians were women. Each of them traveled about 50 miles a day by horse or mule along their rural Kentucky route. These women brought books to thousands of people who would never have received such a service. The long term impacts were profound - but I'll let you read about them yourself. It really is worth an hour or two of your time. If you find yourself intrigued by this topic, you'll also want to read That Book Woman by Heather Henson illustrated by David Small. This is a terrific story about the Pack Horse Librarians, a group created and funded by the WPA following the disastrous Great Depression. The story explains the genesis of the program, and we follow one librarian on her rounds on a brittle, cold day. I first started reading this book with our girls back in April 2015, but for whatever reason, we never got around to finish it and had to return it. We finally borrowed it again in December and read it all in one evening. The narrative is a bit long, but there are a lot of photographs and the story is very interesting. We really enjoyed reading it together. This is a grand little book, a piece of history out of the Great Depression. Every library should have this book front and center. It tells a compelling story of a very successful WPA project, that of librarians delivering books on pack horses to the hill folks, where there were no roads or libraries. And the thirst by the people for reading materials is obvious and powerful.The four stars are also for the fine example this book serves to 4th- 7th graders as a research project well done. Index.Excellent research. Good writing, supported by great archival photographs. Bibliography and index. This is a book that never really found its intended audience. It's marketed for children, but the subject and the reading level are perfect for adults. As a brief overview of early librarianship and an introduction to the extreme poverty of Appalachia, it is a great quick read, but it would take an unusual child to be drawn in by this small slice of history. However, those who love history, sociology, or libraries will learn about those troubled times and be fascinated by the photographs. The authors did a masterful job of research, locating primary sources that provide a solid air of authenticity. During the Depression the WPA funded rural library delivery. Local women rode horses and mules to deliver books and magazines to isolated cabins in the Kentucky hills and backwoods. They were paid $28 per month and rode 50 to 80 miles a week in all kinds of weather to complete their circuits. Adults and children alike were hungry for reading material, whether on practical topics (cookery, medicine), current events (National Geographic), or fiction (classics like Robinson Crusoe and Treasure Island). Kathi Appelt Jeanne Cannella Schmitzer - Lives in College Station, TX with husband Ken and four adorable cats.Two sons, both musicians.Serves on the faculty at Vermont College of Fine Arts in the MFA in Writing for Children and Young Adults Program.